Mailmark is Royal Mail’s £70M investment; launched in 2014 and expanded in March 2015 with a 2D barcode indicia replacing your existing franking impression. Enhanced reporting – Giving you greater control and information with regards to your outgoing mail. This new barcode will record the date of posting, meter number, the format and price; replacing the existing franking impression and when used in conjunction with your franking machine will allow tariff information to be passed between you and Royal Mail. To access Mailmark you will need a Mailmark enabled franking machine capable of printing this new unique barcode and a connection via network port, Wi-Fi or a PC. Mailmark Extra is an exclusive tariff with us which adds an extra 1 pence (1p) discount to your First and Second Class Mail items for 12 months, in addition to the Mailmark tariff discount. 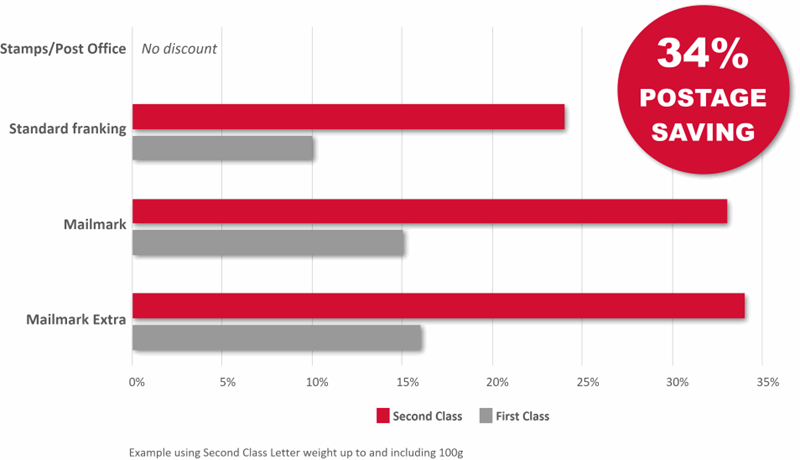 As an example, your Second Class Letter is priced at 61p using stamps, 47p with a non-barcoded frank, 41p with Mailmark and only 40p with Mailmark Extra. We would be very happy to tell you about this service, show you our range of next generation Mailmark-ready machines and how they can offer you the best value. Do you have any questions about Royal Mail’s Mailmark services? If you do then please feel free to contact us directly on 01322 288890.